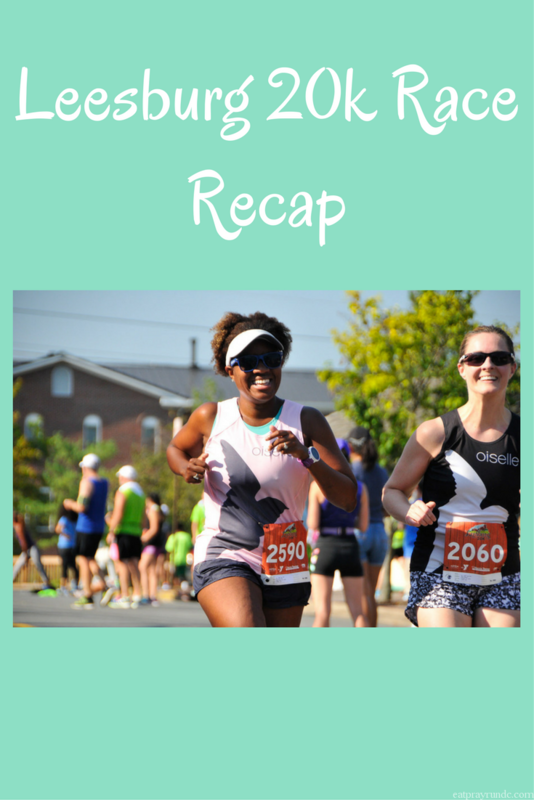 When I first ran this race in 2014, I swore off summer races. It was extremely hot and I wasn’t aware that the whole first half of the race was uphill. This year, I was better prepared. I knew the course well – I had in fact just spent multiple days running on the same section of the trail during Birdcamp (recap coming soon!) and during those runs, I decided to sign up. I thought it would be fun to use the 20k as a long run for the weekend. And it was fun. 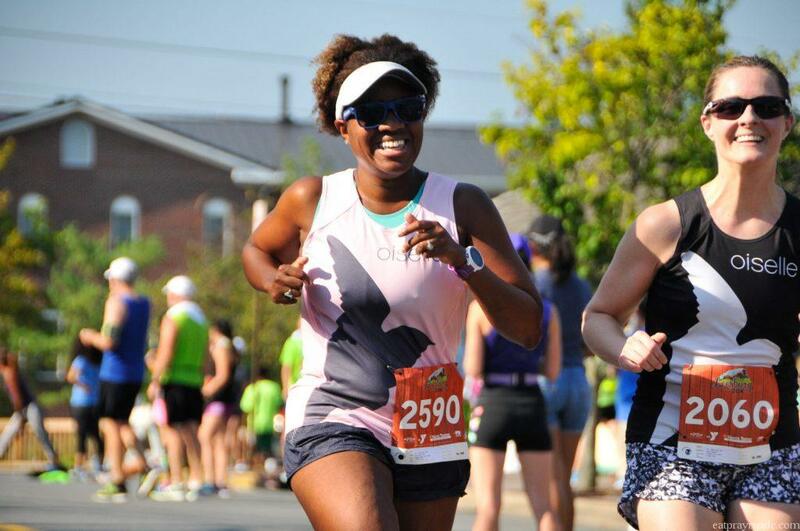 If you are in the DC area and looking for a well managed longer race to use for training or to test your fitness, I suggest you add this one to your calendar. I ran the entire race with my friend and Oiselle teammate Afton and that was awesome. We chatted the whole way and the miles flew by. Miles 1-3 (9:23/9:09/9:16) Afton and I settled in to a comfortable pace and just began chatting away. It turns out, we had a lot to talk about and were involved in a fantastic conversation for just about the whole race. I love running a race with friends. Since neither of us were racing, we just really had fun. Miles 4-7 (9:25/9:20/9:12/9:20) Around mile 4 was when I reminded Afton that this race was not “rolling hills” – it was just straight UP to the turnaround and then a bit more UP and then down all the way to the finish. Miles 8-12.4 (9:29/9:05/9:09/9:05/9:06/8:46 [ last .4]) I think you can guess when we hit the downhill part of the course, hahaha. The last few miles were tough in the way that the last few miles of any race are. This race was a good check in. The course was all uphill for the majority of it and I ran about twenty seconds slower than marathon goal pace and that was conversational. I’m proud of that and it’s good to know that my down couple of weeks didn’t affect my fitness. We were lucky and had good weather for this race and lots of shade along the trail. I am really happy I ran this race and happy with a new 20k PR! Official time: 1:55:45 – a big improvement over the last time I ran this race – when I ran a 2:05! Have you ever raced a 20k? Congrats on your new 20K PR! That’s great that you were able to PR on such a hilly course! Thanks – my quads were on fire, but we had fun with this one! Well done on your new PB even though you were running for fun!! Nothing beats the conversations with friends on a long run! Have never run a 20k! My longest distance is a 15k. But I’m finding I love the longer distances so I’ll soon give it a go! Congrats on the race! I have never raced a 20K but it seems like a fun distance- you ran an awesome time and hooray for a 10 minute PR. Even if you weren’t really “racing” it, it shows how much you have improved in the past few years :). So glad the calf struggles seem to be short lived and behind you, too :). It’s such a funny distance because it’s basically a half marathon. But I enjoyed it! I am too scared of August weather, but you did get lucky this year. Your pacing was awesome! Yes – we REALLY lucked out. I’m hoping our current weather sticks! Congrats on a great and relaxing race AND a 20K PR. Sorry that I wasn’t able to run this year – I would have loved seeing you! Congrats on the PR in tough conditions! You are getting faster and all of that hard work is paying off! Congrats! Awesome, Courtney! That is a very nice improvement over last year and nice confirmation that you’re where you need to be in training. And those negative splits are beautiful. Congrats! Congrats on the new PR! The Leesburg course is anything but easy, so to slice that much time off of your finish time is incredible. Way to go, Courtney!